Glenfinnan has historical significance because that Bonnie Prince Charlie's fight for the British throne gathered momentum. It was here he raised the Jacobite standard and rallied his clansmen for battle. 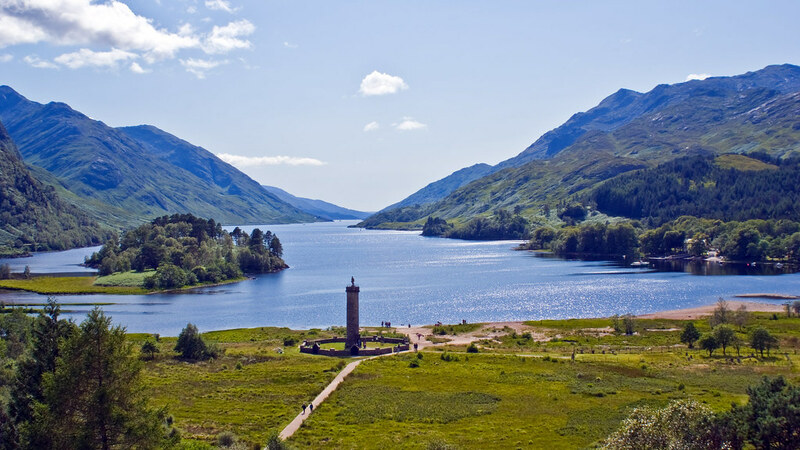 It all started on 19 August 1745 at Glenfinnan, 17 miles west of Fort William at the head of Loch Shiel. Less than a month earlier, Prince Charles Edward Stuart had landed on the Scottish mainland for the first time, on the shores of Loch nan Uamh, between Lochailort and Arisaig (see below). He had come to claim the British throne for his father, James, son of the exiled King James VII of Scotland and II of England. The clan chiefs had expected French support, but when the Prince arrived with only a handful of men they were reluctant to join the cause. Undeterred, the prince raised his standard and his faith was soon rewarded when he heard the sound of the pipes and Cameron of Lochiel, along with 800 men, came marching down the valley to join them. It must have been an incredible moment. There's a powerful sense of history here. You don't have to be Scottish to feel a shiver run down the spine and a tear well in the eye as you gaze across stunning Loch Shiel stretching into the distance, veiled by steep mountains. You can almost hear the wail of the bagpipes in the distance. 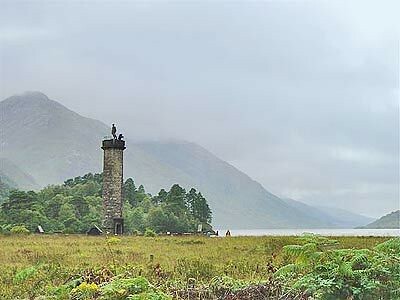 A commemorative tower stands proudly at the head of the loch, erected in 1815 by Alexander MacDonald of Glenaladale in memory of the clansmen who fought and died for the Prince. 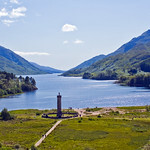 You can climb to the top of the tower (mind your head, though) for even better views down the loch. The Glenfinnan Games are held here in mid-August. On the other side of the road is the National Trust for Scotland visitor centre, which has displays and an audio programme of the Prince's campaign, from Glenfinnan to its grim conclusion at Culloden. There's also a café. Info - Apr-Oct daily 1000-1700, Jul-Aug 0930-1730, Nov weekends only 1000-1600, £3, concession £2. Tel:722250. A mile away, in Glenfinnan village, is the Station Museum, which is housed in the railway station on the magnificent Fort-William to Mallaig railway line. It has displays of memorabilia from the line's 100-year history. Info - Jun-Oct daily 0930-1630, other times by appointment, £0.50. Tel. 722295. You can also sleep and eat here (see below). 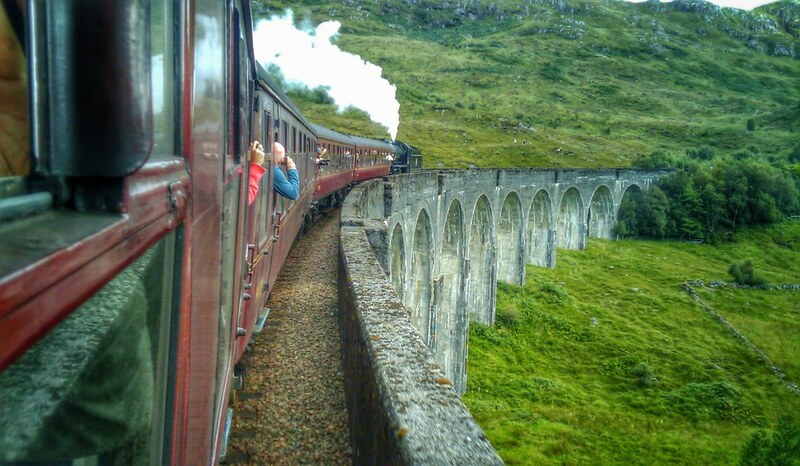 The 1,000-ft span of the Glenfinnan viaduct, between the visitor centre and the village, is one of the most spectacular sections of the famous West Highland Railway. 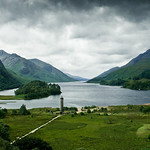 You can take a cruise down Loch Shiel, from Glenfinnan to Acharacle (see above) at its southern end. Contact Loch Shiel Cruises at the Glenfinnan House Hotel (see below). There are sailings most days from April to October. , Tel. 722246, Fax. 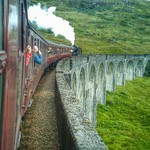 722307, princeshouse@ glenfinnan.co.uk 9 rooms, open Mar-Nov. Comfortable old coaching inn which offers good food (mid-range). Just off the main road is Glenfinnan House Hotel, Tel./Fax. 722235. 17 rooms, open Apr-Oct. Historic house with lots of charm, which is more than can be said for the staff. Overpriced. Dinner served from 1930 (expensive to mid-range for 4 courses). You can also walk in the vast grounds or fish on the loch. A much cheaper option is the Glenfinnan Sleeping Car, at the train station, Tel. 722400. Bunkhouse accommodation for 10 people, also mountain bike hire. You can eat here, too, in the Glenfinnan Dining Car (cheap 2-course lunch; mid-range 3-course dinner). Wooden lodge on the banks of Loch Shiel. Set over 1 floor with three bedrooms sleeping 6. Lovely location. 2 Dogs + blessed peace: no TV! Part of lovely old stone steading near Glenfinnan, north of Fort William. Sleeps 4 people in 2 bedrooms.